At Optimal Health Center, we take great pride in providing the finest chiropractic wellness care to our patients. Below is a sampling of the different approaches to care that we offer at our Overland Park office. We provide advanced spinal correction utilizing "state of the art" chiropractic techniques. Never in the history of chiropractic have we been able to provide the level of help and expertise that now exists. These newer correction methods are even safer, more comfortable and more effective than ever before. Optimal Health Center's doctors have years of training and experience in spinal adjustment. Where neuroscience and motor control meet! Chronic problems? Had numerous chiropractic adjustments with little to no results? NKT may be the missing tool that your body needs!! See our NKT® page for a full explanation of this innovative and effective technique. Can you twist as well to the left as you can the right? Can you balance on one leg for more than 10 seconds? If you answer was "No" to any of those questions then you may very well benefit from an assessment! The SFMA is a movement based diagnostic assessment tool, designed to clinically assess 7 basic movement patterns in anyone with known musculoskeletal pain. The SFMA provides a quick and easy method to systematically finding the cause of symptoms by logically breaking down ineffective movement patterns and diagnosing their root cause as either a movement problem or a stability/motor control problem. We use SFMA as both an initial diagnostic tool but also as means to measure your improvement once you have completed your treatment plan. With enzyme therapy, our goal is not to treat symptoms but to locate the source of stress on your body. With the Loomis system of Enzyme Replacement our doctors examine over 40 organ stress points to find your own sources of stress. Our doctors then develop a program that is specifically designed around your particular needs. We provide specific recommendations on enzyme supplements and healthy food choices to enhance our patients' return to optimal health. Dry needling is a skilled intervention that uses a thin filiform needle to penetrate the skin and stimulate underlying myofascial trigger points (think knots in your muscles), muscular, and connective tissues for the management of neuromusculoskeletal pain and movement impairments. Dry needling (DN) is a technique used to treat dysfunctions in skeletal muscle, fascia, and connective tissue, and, diminish persistent peripheral nociceptive input, and reduce or restore impairments of body structure and function leading to improved activity and participation. Acupuncture involves the insertion of extremely thin needles through your skin at specific points on your body. Although acupuncture is most commonly used to treat pain we also use this technique in our office to relax muscles and increase blood flow to stressed areas. The buzzword currently being used for rolled shoulders and forward head posture is "Tech Neck". 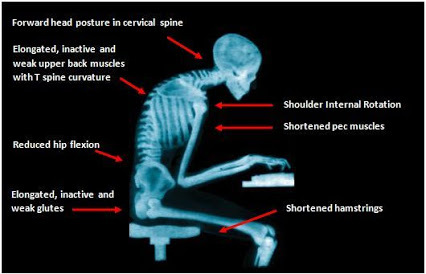 Time spent on the computer or our smart phones is taking its toll on our bodies. The Pettibon system aids in correcting the posture through specific exercises and adjustments by strengthening and remodeling the spine. Our goal is to help restore the normal curves to your spine and thus alleviating pain, fatigue and poor posture.